Preheat oven at 180° and bake Hong Kong Flour for about 5 minutes. Stir evenly and bake for another 5 minutes. Sieve both the flour and icing sugar together, then add the shortening. Mix well. Rinse orange and grate the skin finely. Peel off the the orange skin, and remove the seeds. Add a little water and sugar syrup, and blend the orange slices. Adjust sweetness according to taste. If orange is sweet enough, there is no need to add the syrup. Mix the orange zest and pulp into the orange juice. Amount according to preference. Weigh the juice and ensure it is around 155g. Add in the orange juice slowly and mix well into a smooth dough. Pinch a little and taste if juice is sufficient. After that, let it rest for about 20 minutes. Meanwhile, throw sunflower seeds into the paste and mix well. Make about 16 sweetcorn paste weighing 30g each. Set aside. You can use different types of paste and prepare them in advance. Dust some Hong Kong Flour on your hand or gloves to prevent dough from sticking. Divide the dough into half, and roll into 2 long dough. Then make about 16 balls weighing 25g each. Here, I made different flavours of dough, and paired them with the respective paste for easy making. Flatten the dough, and put a ball of paste filling in the middle and wrap around it. Dust more HK Flour onto hand and roll the dough into a ball. The image is another flavour we had made - Lychee with Matcha paste. Pour some HK Flour onto a tray and also dust some onto mooncake mould. Shake off excess flour. Put the dough into the mould and press gently. Remove the mooncake from mould and you are done! Refrigerate well and serve your Fruity Orange Snowskin Mooncakes with Sweet Corn Paste ( 香橙玉米冰皮月饼 ) chilled! 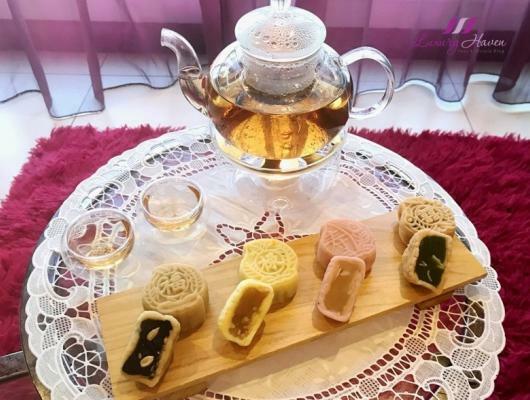 Using Fresh Fruits, these Snowskin Mooncakes had my foodie friends went gaga last year during the Mid-Autumn Festival. 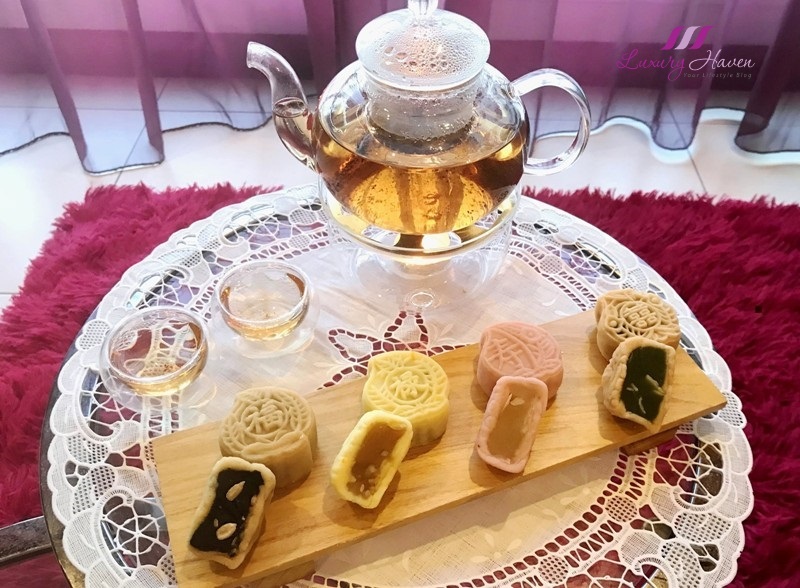 They are in love with the Fu Lu Shou ( 福祿壽 ) mooncakes, representing the three gods of Prosperity ( Fu ), Status ( Lu ), and Longevity ( Shou )!